The Bigger Picture. The first major section of Mark’s Gospel extends from 1:14 to 3:6, and describes the initial phase of the Galilean ministry. Within this section the evangelist records the calling of the first disciples (1:16–20; 2:14), Jesus’ ministry in and around Capernaum (1:21–34), and a series of controversies (2:1–3:6) which are climaxed by the decision to seek Jesus’ death (3:6). Although only 14 verses into the gospel narrative, Mark has already introduced us to John the Baptist and following his baptism, Jesus has already been tempted in the desert (vv.12-13). Then, in a typically abbreviated style, Mark merely refers in passing to the whole story of John’s denunciation of Herod for immorality, and John’s consequent imprisonment and death (for full account, see 6:14–29). The incident serves here only as a date-line, for from this moment began the preaching of the good news by Jesus. In the next passage vv.21ff, we will see the ministry of Jesus begin in Capernaum. It is all very Markan – things moving in rapidly, almost breathless movement from scene to scene. With John’s arrest, Jesus’ work begins. Mark’s “gospel of Jesus Christ, the Son of God” began at v.1; now the good news of God begins, as Jesus’ first words are heard: “This is the time of fulfillment” (v. 15). It is significant that Jesus does not enter upon his own distinctive ministry until after John has been arrested. “After John had been arrested” – the Greek word for “arrested” is paradidomi – the word that is used for Jesus’ “betrayal” or “handing over” (3:19; 9:31; 10:32; 14:10, 11, 18, 21, 41, 44; 15:1, 10, 15). John is Jesus’ precursor in terms of message — “repentance;” in terms of “being handed over;” and in terms of death. The arrest of John and the beginning of Jesus’ ministry are intentionally correlated to show that the gospel is proclaimed and known in adversity and suffering, not in ease and comfort. Mark’s formulation also suggests that Jesus is restrained by God from his ministry of proclamation until the Baptist is removed from the scene. His arrest indicates that the time has come for Jesus to act. 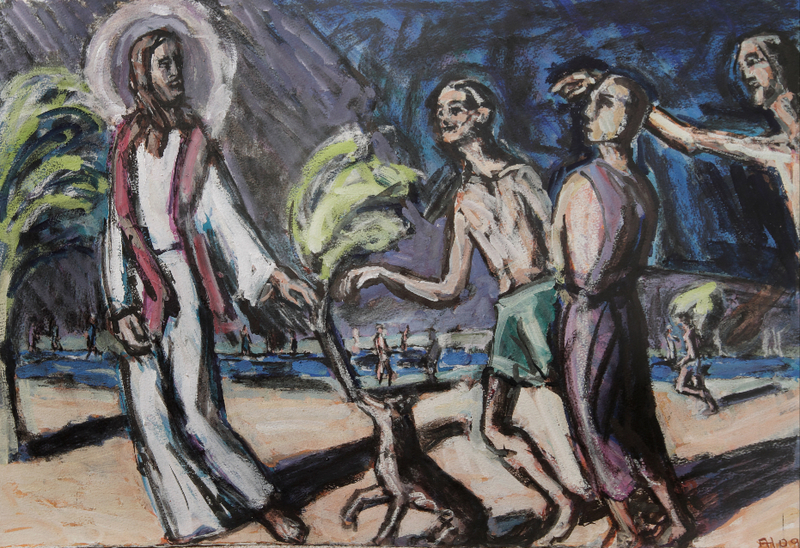 Jesus enters into Galilee proclaiming the gospel of God. Mark 1:14 After John: an impression of successiveness has been deliberately created by Mark where none existed before; historically John’s arrest belongs later. Ch. 6:14 shows conclusively, however, that the activities of Jesus and John were both chronologically and spatially separated. Those who judged that Jesus is John raised from the dead could not have seen the two men working together, or known of Jesus’ baptism by John. The public activity which brought Jesus to the attention of the people could only have begun after John had been removed from the scene through his arrest. Gospel. The word euangelion is from repeated in 1:1 and forms a bookend to conclude the introduction. This entry was posted in Scripture and tagged calling disciples, fishers of men, Mark 1:14-20 by Friar Musings. Bookmark the permalink.